Septic arthritis is also known as infectious arthritis, and is usually caused by bacteria. It can also be caused by a virus or fungus. The condition is an inflammation of a joint that’s caused by infection. Typically, septic arthritis affects one large joint in the body, such as the knee or hip. Less frequently, septic arthritis can affect multiple joints. 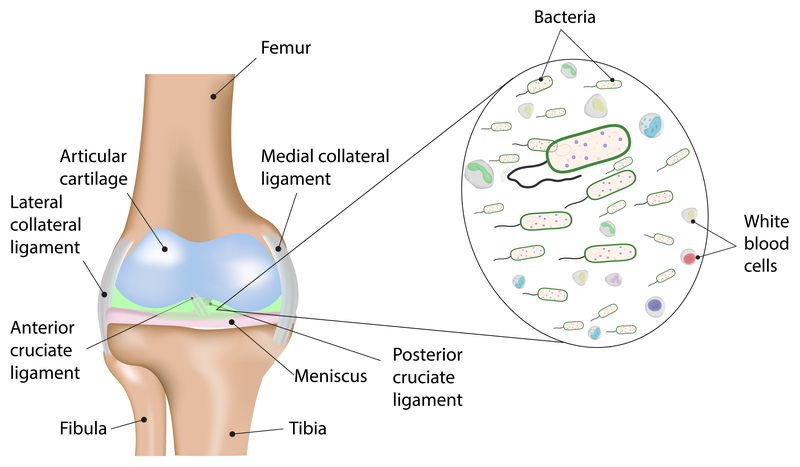 Septic arthritis, also known as infectious arthritis, may represent a direct invasion of joint space by various microorganisms, most commonly caused by bacteria. However, viruses, mycobacteria, and fungi have been implicated. Reactive arthritisis a sterile inflammatory process that may result from an extra-articular infectious process. Bacteria are the most significant pathogens in septic arthritis because of their rapidly destructive nature. For this reason, the current discussion concentrates on the bacterial septic arthritides. Failure to recognize and to appropriately treat septic arthritis results in significant rates of morbidity and may even lead to death. Approximately 20,000 cases of septic arthritis occur in the United States each year (7.8 cases per 100,000 person-years), with a similar incidence occurring in Europe. The incidence of arthritis due to disseminated gonococcal infection is 2.8 cases per 100,000 person-years. Because of the increasing use of prosthetic joints, infection associated with these devices has become the most common and challenging type of septic arthritis encountered by most clinicians. The incidence of prosthetic joint infection (PJI) among all prosthesis recipients ranges from 2% to 10%. These figures may be falsely low because surveillance is limited to the operative hospital, which may lead to underestimation of the rate of PJIs. Septic arthritis is also becoming increasingly common among people who are immunosuppressed and elderly persons. Of people with septic arthritis, 45% are older than 65 years; these groups are more likely to have various comorbid disease states. Fifty-six percent of patients with septic arthritis are male. In adults and children, common bacteria that cause acute septic arthritisinclude staphylococcus and streptococcus. These foreign invaders enter the bloodstream and infect the joint, causing inflammation and pain. Fungi that can cause arthritis include histoplasma, coccidiomyces, and blastomyces. These infections are usually lslower to develop than bacterial infections. Who’s at Risk for Septic Arthritis? Young children and elderly adults are most likely to develop septic arthritis. People with open wounds are also at a higher risk for septic arthritis. In addition, people with a weakened immune system and those with pre-existing conditions such as cancer, diabetes, intravenous drug abuse, and immune deficiency disorders have a higher risk of septic arthritis. In addition, previously damaged joints have an increased likelihood of becoming infected. A procedure called arthrocentesis is commonly used to make an accurate diagnosis of septic arthritis. This procedure involves a surgical puncture of the joint to draw a sample of the joint fluid, known as synovial fluid. Normally, this fluid is sterile and acts as a lubricant. During arthrocentesis, a needle is inserted into the affected joint to collect fluid from the joint. The fluid sample is sent to a lab for evaluation. The lab will perform a white cell count on the fluid, which will usually very high. The lab will also try to culture bacteria or other organisms. This will help the doctor determine if an infection is present and which organism is causing it. X-rays are typically done to look for joint damage. Blood tests can also be used to monitor inflammation. MRI scanning is sensitive in evaluating joint destruction but is less useful in the early stages . Blood tests can also be taken to detect and monitor inflammation. What’s the Treatment for Septic Arthritis? Septic arthritis treatments include using a combination of powerful antibiotics as well as draining the infected synovial fluid from the joint. It’s likely that antibiotics will be administered immediately to avoid the spread of the infection. Intravenous (IV) antibiotics are given, usually requiring admission to the hospital for initial treatment. The treatment, however, may be continued on an outpatient basis at home with the assistance of a home health nursing service. Initially, empiric antibiotics are chosen to cover a wide range of infections. If the bacteria can be identified, antibiotics specific to that organism are used. It may take four to six weeks of treatment with antibiotics to ensure complete eradication of the infectious agents. Is the Infected Fluid Drained? Drainage of the infected area is critical for rapid clearing of the infection. Drainage is performed by removing the fluid with a needle and syringe. Often the draining occurs daily or with multiple surgical procedures. The exact method depends on the location of the joint. Using arthroscopy, your doctor can irrigate the joint and remove the infected tissue. If drainage cannot be accomplished with joint aspirations or arthroscopy, open joint surgery is often necessary to drain the joint. If the fluid buildup is significant, the drains are left in place to remove excess fluid that may build up after the surgery. Septic arthritis is not contagious. However, many of the microbes that cause infectious arthritis can be transmitted from an infected patient to another, including Neisseria gonorrhoeae, Mycobacterium tuberculosis, and HIV. While joint infection occasionally affects people with no known predisposing risk factors, it more commonly occurs when certain risk situations are present. Risks for the development of septic arthritis include taking medications that suppress the immune system, intravenous drug abuse, past joint disease, injury, or surgery, and underlying medical conditions and diseases including diabetes, alcoholism, sickle cell disease, rheumatic diseases, and immune deficiency disorders. People with any of these conditions who develop symptoms of septic arthritis should promptly seek medical attention. Treatment of septic arthritis includes antibiotics and drainage of the infected joint (synovial) fluid from the joint. Optimally, antibiotics are given immediately. Often, health care professionals administer intravenous antibiotics in a hospital setting. The choice of antibiotics can be guided by the results of the culture of joint fluid. Until those results are known, empiric antibiotics are chosen to cover a wider range of possible infectious agents. Sometimes, combinations of antibiotics are given. Antibiotics may be required for four to six weeks. Drainage is essential for rapid clearing of the infection. Drainage of a joint effusion can be done by regular aspirations with a needle and syringe, often daily early on, or via surgical procedures. Arthroscopy can be used to irrigate the joint and remove infected joint lining tissue. If adequate drainage cannot be accomplished with joint aspirations or arthroscopy, open joint surgery is used to drain the joint. After arthroscopy or open joint surgery, drains are sometimes left in place to drain excess fluid that can accumulate after the procedure. What are complications of septic arthritis? Rapid clearing of the infection is critical to preserve the joint. If appropriate antibiotics are begun immediately, joint integrity can be maintained, and return to function is expected. If the infection has been longstanding, the possibility of joint destruction exists. The keys to successful outcome are rapid medical attention and drainage and the accurate administration of antibiotics to which the offending microbes are susceptible. What is the prognosis of septic arthritis? The outlook for septic arthritis depends on the precise microbe causing the infection, the duration of the infection, and the underlying overall health of the individual infected. Some types of microorganisms are more aggressive and difficult to treat than others. The longer the infection is present, the more opportunity for damage to affect the joint. People whose immune systems are not functioning optimally are also at risk for more joint damage. Moreover, if septic arthritis leads to infection in other parts of the body, other organs can be affected. How do health care professionals make a diagnosis of septic arthritis? Health care professionals make a diagnosis of septic arthritis by identifying infected joint fluid. Joint fluid can easily be removed from a patient in an office, hospital, or clinical setting with a needle and syringe. The fluid is analyzed in a laboratory to determine if there is an elevated number of white blood cells to suggest inflammation. A culture of the joint fluid can identify the particular microbe and determine its susceptibility to a variety of antibiotics. X-ray studies of the joint can be helpful to detect injury of bone adjacent to the joint. MRI scanning is very sensitive in evaluating joint destruction. Blood tests are frequently used to detect and monitor inflammation. These tests include the white blood cell count, sedimentation rate, and C-reactive protein.